During NADA Show 2019 in late January, Auto Remarketing asked Hallett what he aims to emphasize about the used-car market when he talks to audiences of such venues as “Mad Money” that cater to an investment-minded crowd. “I think that those that invest in our industry will not limit themselves to the box of the new-car franchise. 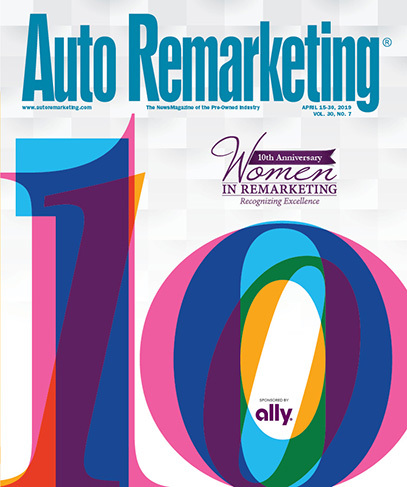 They will continue to look at how they can vertically integrate the business model, tapping into other parts of the business such as financing, such as used-car-specialized business models and collision centers,” she said in an interview at the NADA Show for an upcoming episode of the Auto Remarketing Podcast. In a seperate Auto Remarketing story, Kerrigan explains two factors that are driving the appeal of investment in franchised car deaershps. The tech-driven changes in auto retail, particularly those around digital retailing, plus a generational torch-passing, are leading many family-owned auto dealerships to consider exiting the car business and selling their stores, says Erin Kerrigan, an expert in valuation, real estate and the buy-sell space of auto dealerships. “The good news is, it’s also the same reason that the investors and buyers want to get into the game,” said Kerrigan, managing director of Kerrigan Advisors, in an interview for an upcoming episode of the Auto Remarketing Podcast at NADA Show 2019. The Blue Sky Report published by Kerrigan Advisors is distributed to 9,000 people in 35 countries, she said, and with that reach, the firm gets contacted once a week by new capital sources — including private-equity firms, family offices and billionaires — who want to move into auto retail.